Protection from the elements is done very efficiently by a dog's coat, but depending on the breed, they may be a bit more vulnerable to the sun's rays. Not all breeds have the skin protection of thick body fur and are susceptible to sun burn. Over-exposed noses and ears, or the body itself in hairless breeds, can suffer from sunburn just like with our unprotected skin. An herbal salve made up of St. Johnswort, Comfrey and Lavender, this balm not only repairs damaged tissue but calms down the inflammation and pain that follows a burn. Check with your veterinarian before using on cats. Essential oils can be toxic to a cat's liver if ingested. Or let me know and I'll leave out the essential oils. First step for burned skin is to cool down the damaged skin with wet, cold compresses. Don't use ice water or ice cubes. Once the burn is cool, it is ok to apply applications of this soothing salve. You don't want to apply it before the skin is completely cooled or you'll be trapping in the heat. 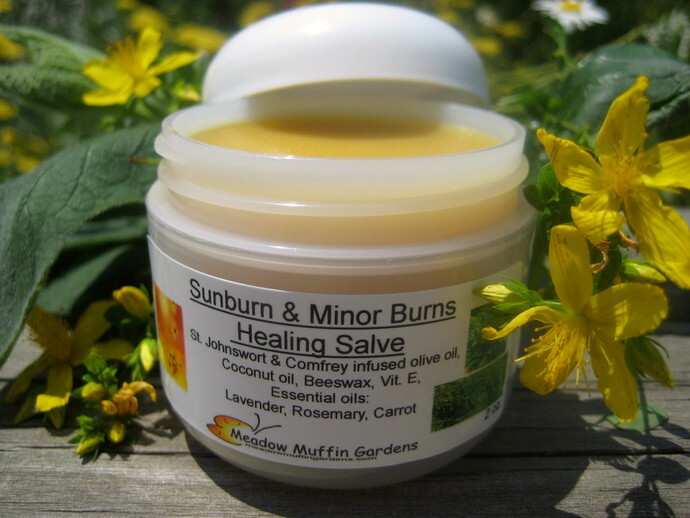 The advantage of a salve is that it stays put and provides protective coverage without needing a bandage, therefore the burn has needed exposure to the open air. St. Johnswort is a summer solstice-blooming yellow wildflower that blooms around June 21st here in the Northeast. The buds and flowers contain hypericin, a treasure responsible for the plants healing powers. You know you have the correct plant if the buds bleed red when squeezed. St. Johnswort oil is used for nerve related conditions, sore muscles, abrasions and in this case, a sunburn remedy. Many healing balms contain the garden herb, Comfrey. The allantoin content in this living medicine chest stimulates and accelerates tissue repair. Used for everything from sprains, wounds and scar tissue to the healing of burned skin. Each of these herbs had been infused in cold-pressed extra virgin organic olive oil. Olive oil contains antioxidants that can help reduce damage. Olive oil and the beeswax used to thicken up the salve are incredibly soothing and help keep the skin from drying out. Coconut oil is wonderful for its cooling nature and often used for burn remedies. The unique combination of fatty acids in coconut oil help relieve inflammation and provide the needed moisture. Added are three very beneficial essential oils: lavender, rosemary and carrot seed. Lavender's reputation for burn treatment originates with the "father of aromatherapy", the french chemist Dr. Rene-Maurice Gattefosse. He burned his hand very severely and quickly immersed it into a vat of lavender oil. He was amazed how quickly his hand healed without scarring. Rosemary, a cleansing and antiseptic oil, combines with lavender to increase circulation, reduce inflammation and relax the muscles. All of which aid in regenerating new tissue. Carrot seed oil is added because its beta-carotene levels have been shown to protect against ultra-violet-induced skin cancer. Besides the sun, our pets can suffer burns from such mishaps as getting against a hot car or motorcycle muffler, splashed with hot water, a careless cigarette or any number of accidents. Treat minor burns yourself but if you suspect the burn is deeper than first degree please seek the advice of your veterinarian before treating your pet yourself. This herbal salve comes in a 2 oz. plastic jar.